There’s a quarter-final cracker on the cards in the PFA Senior Cup. Peterborough Premier Division leaders Moulton Harrox will visit third-placed Whittlesey in the last eight in the new year. Harrox have won all 13 of their top-flight matches. Whittlesey have won their last 11. The teams meet in a Premier Division game, also at Feldale Field, on December 19. 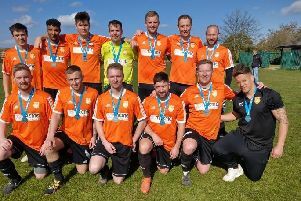 Harrox booked their quarter-final place with a 4-0 win over Premier Division rivals Thorney last weekend. Joe Townsend and Olly Maltby shared the goals. Premier Division side Langtoft travel to Division One promotion contenders Wisbech Town Reserves in a last-16 tie this Saturday. The winners visit in-form Pinchbeck. Quarter-final draw: Stamford Lions v Warboys Town or Netherton United, Pinchbeck United v Wisbech Town Reserves or Langtoft United, ICA Sports v Baston, Whittlesey Athletic v Moulton Harrox. Whittlesey host ICA Sports in a league game this Saturday when Harrox travel to Sawtry.